God is not mocked. This applies to us as individuals and to kings and leaders of great nations and empires. God is in control of human history and controls the rise and fall of nations. A case in point is Alexander III of Macedon (Greece), whom we know as Alexander the Great. Born in 356 BC, he was the most successful world conqueror of all time. Though his name is never mentioned in the Bible, Alexander was such an important figure in world history that chapters 2, 7,8 and 11 of the book of Daniel all contain prophecies of him and his kingdom. At age 16 Alexander, who was actually tutored by Aristotle, became co-leader of Macedon with his father, King Phillip, who was the first to unite areas of Greece into an organized political force. 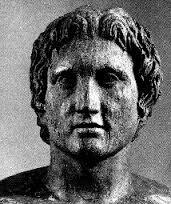 After his father was killed by enemies, Alexander became king at the age of 20. He immediately engaged in military campaigns and united all of Greece under his authority. He aggressively conquered Asia Minor, then the Mediterranean coast all the way to Egypt. There he founded the city of Alexandria. So strong was pride and arrogance, he ultimately named more than sixty other cities after himself. His ambitions led him east where he crushed the Persian empire in 327 BC, the second of the four successive earthly kingdoms determined in Daniel’s dream: 1) the Babylonians Empire, 2) the Medo-Persian Empire, 3) the Greek Empire, and finally, 4) the Roman Empire. This is a vision of Christ (son of man), ushering in His “spiritual” kingdom (that will never be destroyed) as He did during the Roman empire and establishing His dominion after his death, resurrection and delivery of the Holy Spirit on earth during Pentecost (Acts 2). All human heights and accomplishments should be judged in context of the Kingdom of God, the true measure of glory and greatness. Alexander continued his fierce expansion east to India and then returned west to his homeland with war-weary soldiers and adoption of the style of a Persian court, including a large harem. In the last year of his life he demanded that his Greek subjects recognize his greatness by worshiping him as a god. He shortly died under suspicious circumstances at the age of only 33. He ruled boldly for thirteen years and conquered most of the known world. His triumphs spread a Greek influence over the Near East that would last a thousand years. Note that it is because of Alexander the Great that the New Testament was written in the most common language then known around the world, Greek. But after his death this mighty kingdom of Alexander’s was divided up by his Greek generals into four parts. There was no heir, just a quick demise and disappearance of a man who sated his every human craving. Perhaps a mission accomplished, but a truly foolish king in godly purpose, wisdom, and understanding. Do you believe God controls kingdoms and leaders? ‹ Modern Fatherhood – Good or Great?